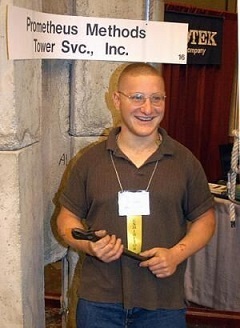 Twenty-six-year-old American communications contractor Nick Berg was beheaded a hostage in Iraq on this date in 2004 — allegedly by the personal hand of Al-Qaeda in Iraq chief Abu Musab al-Zarqawi. A veteran of the mujahideen who drove the Soviets out of Afghanistan in the 1980s, Zarqawi spent most of the 1990s in a Jordanian prison but was amnestied just in time to rejoin militant Islam before it became a post-9/11 boom industry. Zarqawi’s Jordanian terrorist group Jama’at al-Tawhid wal-Jihad, founded in 1999, transitioned with the American invasion of Iraq into the Al-Qaeda franchise in that country, a feared prosecutor of the sectarian civil war there, and the lineal forbear of the present-day Islamic State (ISIS or ISIL). It also became a lusty early adopter of the emerging beheading-video genre: an ancient penalty perfectly adapted for the digital age. This ferocious group was a severe mismatch for Berg, a Pennsylvanian freelance radio tower repairman (and pertinently, a Jew) who set up his Prometheus Methods Tower Service in the northern city of Mosul* in the months following the 2003 U.S. invasion. This was also around the time that American occupation forces’ abuse of Iraqi prisoners at Abu Ghraib came to light — a powerful excuse for blood vengeance. Berg vanished from Baghdad in April 2004, and was not seen in public again until the whole world saw him: the unwilling feature of a May 11 video titled Sheik Abu Musab al-Zarqawi slaughters an American infidel with his hands and promises Bush more. Warning: Mature Content. This is both a political document of our time, and a horrifying snuff film. Notice that Berg appears in an orange jumpsuit, a seeming allusion to Muslim prisoners being held by the United States at Guantanamo Bay. Twenty-five months later to the day, Zarqawi was assassinated by a U.S. Air Force bombing. * As of this writing, Mosul is occupied by Zarqawi’s creation, the Islamic State.